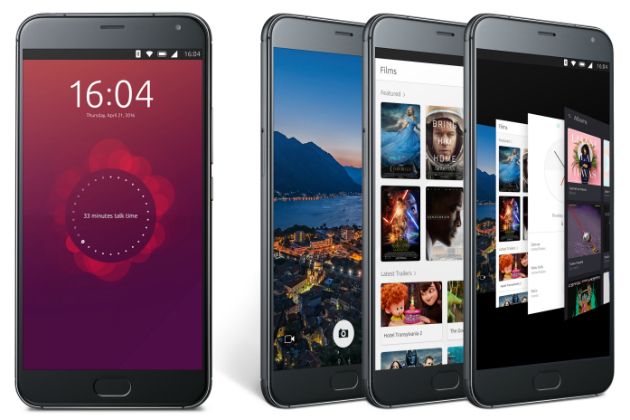 Once again, it's the Chinese smartphone manufacturer Meizu that's helping Canonical sell its vision of an Ubuntu handset. Following the MX4, the company has unwrapped the "Ubuntu Edition" Pro 5, which promises the best spec sheet in an Ubuntu phone to date. That is, without you installing the platform on another device manually, anyway. It's a large handset, dominated by a 5.7-inch AMOLED display (1080p) and a small fingerprint sensor. Under the hood is an eight-core Samsung Exynos 7420 processor, backed up by either 3GB or 4GB of RAM, which varies depending on whether you choose 32GB or 64GB of internal storage. The rest of the phone is equally impressive, at least on paper. A 21-megapixel camera sits on the back, while a 5-megapixel snapper rides up front for selfies and video calls. Everything draws power from a 3050mAh battery which, at least in China, can be quickly topped up using Meizu's "mCharge" technology. In short, it's the exact same hardware found on the regular Pro 5, which runs Android Lollipop rather than Ubuntu. With plenty of power, this device should appeal to some of Ubuntu's biggest fans. (The Ubuntu Edge eclipsed it in some areas, but didn't make it past the crowdfunding stage.) We've never had a problem with the hardware from Canonical's partners though -- it's the platform itself that needs some work. Ubuntu on mobile is a novel experience and there are some promising ideas, such as Scopes, which rethink how information should be packaged and presented on your phone. But development has been slow and in the years we've been tracking the platform its biggest rivals, Android and iOS, have made huge leaps in design and utility. With its first tablet, the BQ Aquaris M10, Canonical has finally delivered its "Convergence" feature which lets you plug in a monitor and use it like a PC. Microsoft is touting a similar service with Continuum on Windows 10 Mobile, although we're yet to be sold on the overall concept. Canonical says that while the Pro 5 lacks MHL output, it's running the latest Ubuntu code and "is capable of providing a traditional desktop experience." If and how that functionality will materialize, however, is currently unclear. Pre-orders for the Pro 5 Ubuntu Edition will begin on Monday, during Mobile World Congress in Barcelona. Canonical is staying tight-lipped about the price but says anyone around the world, including people in the US, will be able to buy one online. (That makes a change from previous handsets, which took six months to cross the pond.) We'll give you some impressions once we've tried the device ourselves in sunny Spain.